A very nice and clean example of this quite scarce US Army item from that short period in the early 60s when the catalogue was pretty well stocked with American military items for some reason I have never fully understood. One of many items using the Commer ¾ ton van casting, this has the device to remove the rear section (so you could mix and match with milk floats and things if you really wanted to!) And here it hides the battery for the flashing lamp. 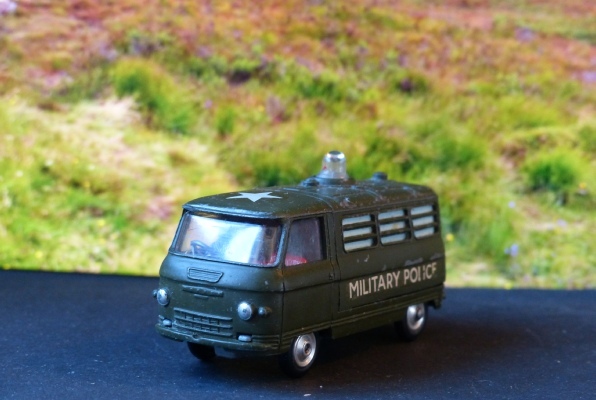 It is identical to the ‘County Police’ van in dark blue but with red seats and a driver. The County Police one had no driver. I have yet to test the flashing light. After replacing the bulb and cleaning all the contacts I could find I still couldn’t get the bulb to light on my blue police van so I am not expecting much here either but you never know. Everything looks clean and serviceable. This is in good condition with a good roof star and most of the lettering on one side but some characters missing on the other side and rear door. Overall, though, with clear windows and good suspension and tyres this is a worthwhile investment or addition to your collection.